Thursday, July 18, 9:00-11:00 a.m. The Hawaii State Department of Health and the Hawaii State Department of Agriculture are sponsoring an outreach workshop to assist farmers and public entities in complying with the new pesticides rule (HAR Ch. 11-55, Appendix M), adopted in October 2012. 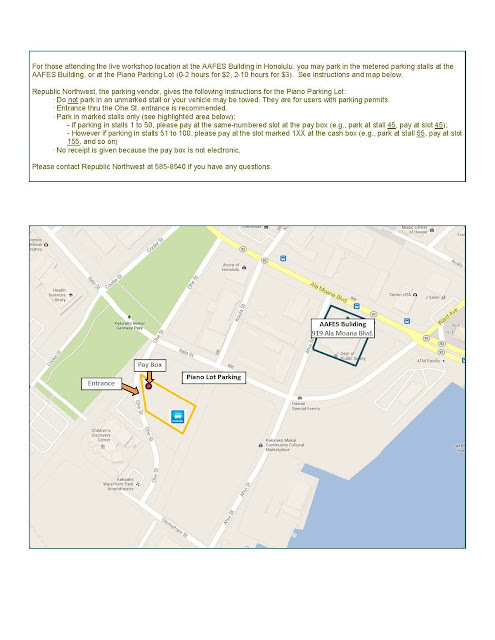 If you use pesticides, insecticides, herbicides, fungicides, rodenticides, or various other substances to control pests, this meeting may apply to you. Of concern is whether these substances will be applied to or will enter waters of the state. 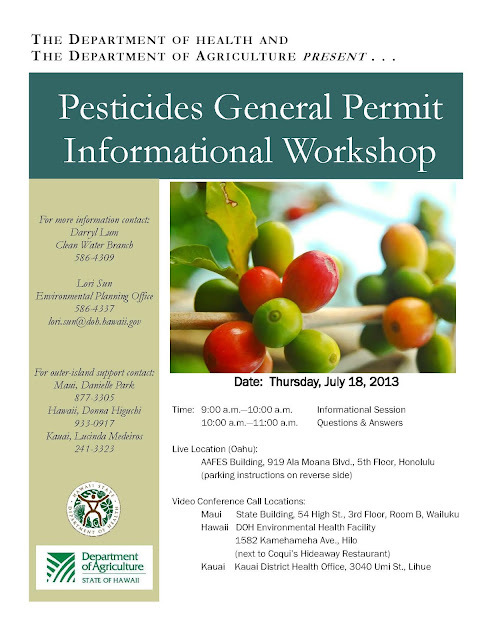 Come and find out whether you are required to apply for a Pesticides General Permit, and receive assistance in complying with the new rule. See the attached flyer for location details (live location on Oahu, video conference call locations on Maui, Hawaii, and Kauai). Senators have honored Dr. Dennis Gonsalves with a Certificate of Recognition today for his work and research in the field of agriculture. Gonsalves led a team of researchers that developed the first ringspot virus-resistant papaya in 1991, known as the Rainbow Papaya. Before the Rainbow Papaya was released to growers in 1998, the ringspot virus had reduced Hawaii’s papaya production by 50 percent. Gonsalves and the transgenic Rainbow Papaya he and his team developed virtually saved the Hawaii papaya industry from almost total demise. Born and raised in Kohala, Gonsalves is an award-winning researcher who has received international recognition for his work. 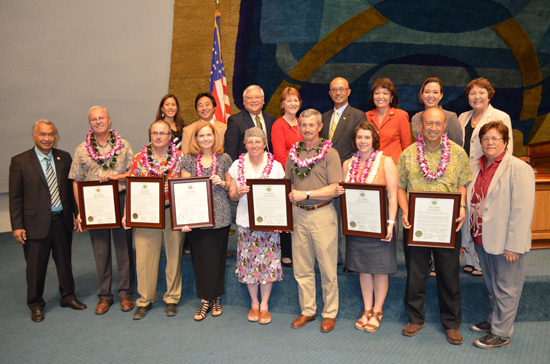 The Senate also recognized farmers honored by the Hawaii Farm Bureau Federation and the Hawaii Crop Improvement Association. 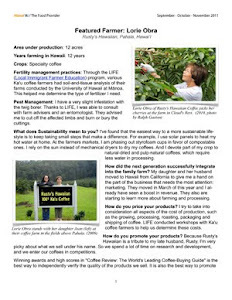 The farmers traveled from the mainland to share their stories about how biotechnology is helping them with real agricultural challenges to ensure a sustainable food supply. 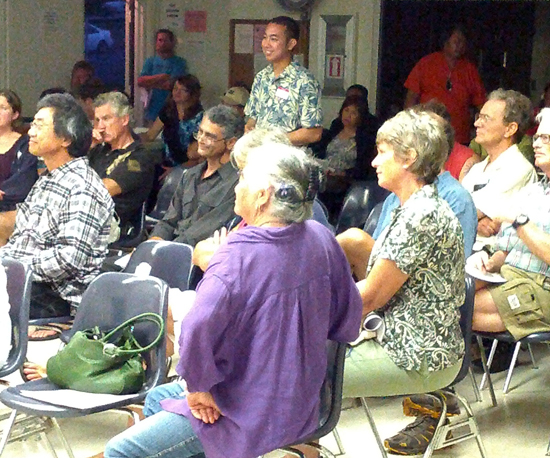 More than 60 people gathered March 22 at the Pahoa Community Center for an agricultural talk-story session. The Interim Dean of the University of Hawaii at Hilo’s College of Agriculture, Forestry, and Natural Resource Management (CAFNRM), Dr. Bruce Matthews, industry experts from the Hawaii Island Papaya Association, and County Council Member Greggor Ilagan of District 4, discussed the current state of agriculture and concerns for the future of food with the community. The community had questions regarding issues of soil fertility, community gardening and resources available to remedy the increasing concern with food safety and sustainability. “This right here, is what we need more of,” said Ilagan, as he facilitated communication between the community and Matthews. “Everyone agrees; we need more collaboration, cooperation and action between the individuals in the community, agencies and schools, and the policy makers,” Ilagan said. Also in attendance was Rep. Faye Hanohano, Eileen O’Hara, a representative from Sen. Russell Ruderman’s office, and Dennis Kauka Jr., aide to Council Member Zendo Kern of District 5. The talk-story session was a prelude to Ilagan’s continued collaboration with community members to increase efforts and efficacy in agriculture. For more information, call Ilagan’s office at 965-2712 or e-mail gilagan@hawaiicounty.gov. The Hawaii Department of Agriculture (HDOA) is currently accepting applications for a new round of organic certification cost-share assistance to organic farmers and organic livestock operators. Renewed federal funding totaling up to $65,000 has been allotted to help Hawaii organic farmers with the cost of organic certification through a cooperative agreement executed between the U.S. Department of Agriculture (USDA) and HDOA. To receive reimbursement, the date of certification or renewal by a USDA accredited certifying agent must occur between October 1, 2012 and September 30, 2013. 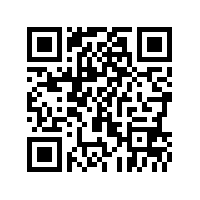 For applications and information click here for the HDOA website. A 'talk story' session on agriculture and gardening will be held at the Pahoa Community Center this Friday. Hawaii Department of Agriculture photo. Hawaii County Councilman Greggor Ilagan’s office is inviting the community to participate in a ‘talk story’ session with experts from the agricultural industry on Friday, March 22 at 5:30 pm in the Pahoa Community Center. The discussion will include Bruce Mathews, Phd, the Interim Dean of UH Hilo’s College of Agriculture, Forestry and Natural Resource Management. “We need to get boots on the ground to help people with all aspects of gardening and agriculture,” said Mathews. Friday’s session will feature an overview of the UH Hilo program, workshops, and educational opportunities for farmers and gardeners. Grant funding may also be discussed. 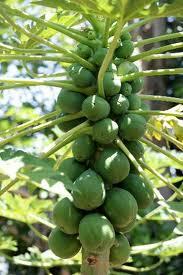 Members of the Hawai`i Papaya Association will also be present to answer questions. A sign-up sheet will be available for future workshops on vermicomposting by horticulturalist Dr. Norman Arancon. Vermicomposting relies on earthworms to create nutrient-rich organic fertilizers and soil conditioners. Anyone is invited to attend. Questions about Friday’s session may be directed to the office of Councilman Ilagan at 808-965-2712. He may also be reached by email at gilagan@hawaiicounty.gov. For more information on vermicomposting, contact Dr. Arancon at normanq@hawaii.edu. Shoppers visit the Hilo Farmers Market on Wednesday afternoon in downtown Hilo. Cash-based businesses could be facing more pressure from Hawaii tax collectors. The state Department of Taxation is seeking to amend a state law that allows businesses that rely on cash transactions, such as vendors at farmers markets or swap meets, to avoid penalties for not keeping proper records of sales if they don’t do more than 10 transactions a day. Department spokeswoman Mallory Fujitani said the law was passed to give smaller businesses “some flexibility” in case they weren’t familiar with state tax law. But it has since opened the door to abuse, she said, with some businesses claiming they do too few of sales to pay taxes or keep records even when that’s not the case. How much the state loses in revenue because of that is hard to estimate, she said. “We need to encourage them to do record keeping that’s required of all other taxpayers,” Fujitani said. Lawmakers are considering a bill to make the change. Senate Bill 1196 passed the Senate and is up for consideration by the House Committee on Finance. R. Peterson, a Hilo Farmers Market vendor who declined to give her full first name, said she is concerned the rule change would place too much pressure on the smallest of business owners. “It’s just more paperwork,” she said. “I’ll have to invoice everything I do. Fujitani said the department is aware of the challenges of keeping track of sales for vendors who do fast-paced transactions. She said the department recommends that they keep a tally sheet nearby so that each item sold can be easily marked. If the bill is adopted, Fujitani said the department would still be focused on putting education before penalties. Warnings would be given first. “Even with the warning, what they try to do is first visit and do education,” she said of inspectors. “The second time around they may give a reminder. The state has three tax inspectors but is looking to fill another three vacant positions, Fujitani said.